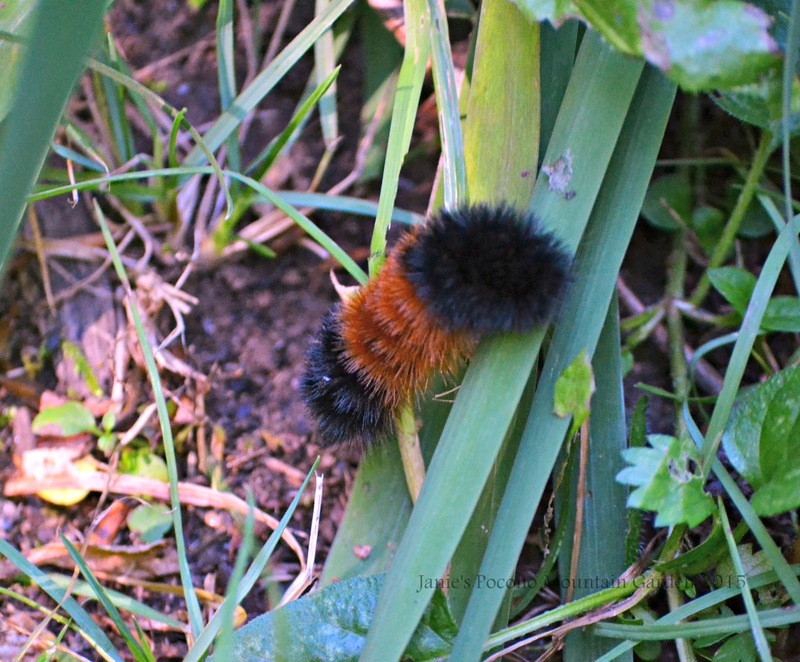 Janie's Pocono Mountain Garden: Woolley Bear Caterpillars Are Back! What Kind Of Winter For 2015-2016? Woolley Bear Caterpillars Are Back! What Kind Of Winter For 2015-2016? It's almost the end of September 2015, and the Woolly Bear Caterpillars are back as you can see from the first photo below. If you've been reading my posts for the past year, it was September 30, 2014 that I first wrote about these fuzzy weather forecasters. The story goes like this. If the orange band across the center of the caterpillar is wider than the black bands, a mild winter is predicted. If the black bands are wider, it will be one doozy of a winter with lots of cold and snow. To my eye, the photo above shows a tiny bit more orange across the center than last year. Now, this is a photo from last year, September 2014. Don't the darker bands look wider? If you live in the Northeast, I'm sure you remember last winter. I'm certain Boston, MA does. September 2015. Wider orange band. Even a teeny, tiny, itsty bitsy bit wider? Ahh ... now you see it. cute caterpillar, interesting cute post. We need a caterpillar like that here to predict drought.